Pure Garden 50-201 Well Water Fountain | Fountain City Art Ctr. 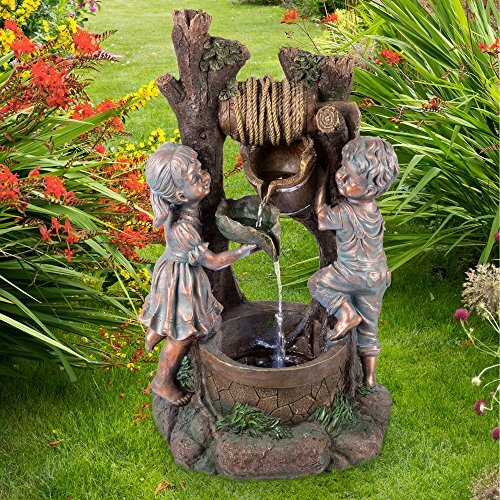 The soothing water sounds and antique look of the Children at the Well Fountain by Pure Garden brings tranquility, relaxation, and whimsical beauty to your outdoor living area. The outdoor fountain features a polyresin construction for weatherproof durability, included pump with maximum flow of 79 gallons per hour, and is easy to set up for low stress assembly. Whether you use this fountain as decoration in your garden, on the patio, on your deck, or near the entranceway in front of your home, this water fountain is sure to bring an ambiance of peace and serenity, while leaving an elegant lasting impression! UNIQUE OUTDOOR DÉCOR- This Children at the Well Water Fountain is truly an ideal blend of antique vintage design with classic elements . With the water cascading down the two tiers, the fountain is sure to be a vivid focal point for your outdoors. LOW MAINTENANCE AND EASY SET UP- Pure Garden water fountains require no additional plumbing, stressful setup, or upkeep. All you need to do after assembly is fill it with the proper amount of water, and plug it in to a standard electrical outlet. PRODUCT DETAILS - Fountain dimensions: 30" H x 14.5" W x 18.8" L. Material: Polyresin. Weatherproof. Pump Included. Adjustable Valve. Voltage: 120V. Wattage: 3.5W. Certifications and Listings: UL. Prelit: 4 LED lights. Cord Length: 118"